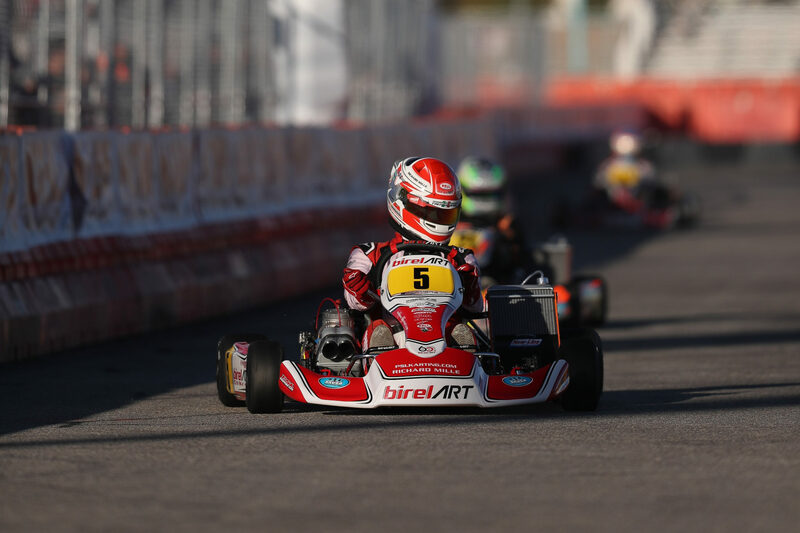 The 22nd edition of the SKUSA SuperNationals, the pinnacle event of the 2018 Superkarts USA calendar has put in gear on Thursday with the Qualifying sessions taking place on the 1.1-kilometre temporary circuit drawn on the parking lot of the famous Rio All-Suite Hotel and Casino of Las Vegas. Following seven practice sessions spread over two days of intense track-action, it was time for the 532 listed-drivers (split into ten classes) to enter qualifying mode and grab the highest grid position available to start the Heats scheduled on Friday. The KZ category, the first of three gearbox-powered engines classes in this event, saw Netherlands’ Marijn Kremers (main picture) topping the lap chart (40.204), 0.018 of a second ahead of the Swede Noah Milell (40.222). Three-time winner of this event, Paolo De Conto will be on the second row (third -best in 40.227) with KZ newcomer Kyle Wick (40.298) by his side. F1 legend Rubens Barrichello conceded a bit over 3 tenths of a second on the pole-sitter to qualify his Tony Kart chassis in 11th position for the Heats. The Senior class and its impressive 87-driver packed entry list delivered its qualifying verdict at the end of the double-session topped by Cedrik Lupien in 42.992 seconds. The drivers will be split into four groups heading for the Qualifying Heats, so the leading Canadian is due to start on pole in the Group A. Brazil’s Mattheus Morgatto was second in lap time (43.023) and took the hot spot in the Group B, a similar situation for last year’s victor Joshua Car (43.071), from Australia, in the Group C, while Rosberg Racing’s leading man Lorenzo Travisanutto came home with the fourth-fastest time (43.074) to secure pole in the Group D. Among other big names to keep an eye one: Barbados’ Zane Maloney was tenth overall (P3 on the Group B grid) in 43.159 seconds and Spain’s Pedro Hiltbrand (43.361) will start from P8 in the Group B for his first appearance at the SuperNationals. The Junior class, featuring 77 drivers divided into two qualifying groups, saw the Polish Tymoteusz Kucharczyk setting the overall fastest lap in 43.605 seconds. As for the Seniors, the class is to be split into four groups competing against each other for the Qualifying Heats, this means that Kucharczyk will start on pole position in the Group A. Second fastest overall (and pole-sitter for the Group B) is the Americain John Burke (43.665) who only conceded six hundredths of a second to his closest opponent. Third in the classification (and pole-sitter in the Group C) is last year’s winner in the Mini Swift category Connor Zilisch (43.677) while the fourth-best lap time (and last pole position at stake) went to 2016 SuperNationals’ champion Tyler Gonzalez (43.787), all of them setting their performance in improving track conditions during the afternoon’s second qualifying group. Italia’s Gabriele Mini’ set the overall eighth best lap (43.824) in front of Netherlands’ Kas Haverkort (43.952). Defending champion Billy Musgrave (40.626) took pole position in the 50-driver packed Pro Shifter category. By his side on the front row of the Heats grid will be France’s Jeremy Iglesias (40.913). AJ Myers (40.953) and Mexico’s Emiliano Salazar (40.966) will be starting alongside each other on the second row, while Jason Pettit (40.981) and Kyle Wick (41.019) will be fifth and sixth respectively. Involved as well in the X30 Senior class (see above), Pedro Hiltbrand concluded his session with the 13th lap time (41.209) in the pocket. Runner-up in this event back in 2015, Rob Logan felt comfortable in the Master Shifter Qualifying session, in which 33 (out of 35) drivers took part, by putting in the best performance on one lap in the third gearbox class: 41.586 seconds. Not far behind is the Australian Jason Faint (41.661), second of the class in last year’s SuperNationals, followed in third by the triple-SKUSA Pro Tour S4 Master winner Jordon Musser (41.799), Mike Mantel (41.919) and Nathan Stewart (41.944). Two times SuperNationals winner Kip Foster has put himself in gear to top one of the most-experienced classes on track this week. The Australian set the reference-time in 43.789 seconds in front of Brazil’s Eduardo Dieter (43.841), logically on pole in the Group B as the 74 drivers will be split into four groups (A, B, C, D) for the Qualifying Heats to take place this Friday. Billy Cleavelin was third (43.861, on pole in Group C) with Jason Burns fourth (43.864, on pole in Group D) followed further back by Kris Walton (43.869), the third Australian driver to make it into the qualifying top 5. Thanks to a 45.417 second lap time, Colton Ramsey has been able to top the 41-driver list of the first of the two classes featuring 100 CC-powered engines, a first in the 21-year long history of the SKUSA SuperNationals! Slower for just 0.006 of a second, Scott Foster (45.423) will join him on the front row of the qualifying grid. Austin Osborne (45.502) and Steve Barros (45.522) will be starting one row behind while the fifth-fastest performance was produced by Josh Hotz in 45.524 seconds. Margins were tight among the 35 drivers in the other 100 CC powered-engine category. Lucas Mars, one of the class’s favourites, grabbed the pole position (46.238) less than one-tenth of a second faster than Kyffin Simpson (46.319) while 0.019 second separated Dylan Christie, third in 46.354, and Bryson Morris in fourth (46.373). 2018 US Pro Kart Series champion in the category Jacob Graham concluded his own session with the fifth-best performance in 46.387 seconds. Two-time SKUSA Pro Tour champion Carson Morgan set the pace in the Mini Swift class with a lap time of 48.167 seconds putting him at the forefront of the Group A, as the 53-driver class is to be split into four groups (A, B, C, D) heading for the Qualifying Heats on Friday. Jamaïca’s Alex Powell (48.240) emerged as the second-fastest to take pole in the Group B, imitated by 2017 SKUSA Pro Tour Micro Swift champion Elliot Cox for the Group C (third-fastest overall in 48.279) while the last pole at stake went to Aden Rudolph (fourth-fastest in 48.313). Among the 40 youngest drivers to contest this year’s SKUSA SuperNationals, the American Tristan Young made good use of his 8-lap qualifying session to set the fastest mark (49.550) reaching the top speed of 80 km/h onto the 12-corner circuit. This year’s SKUSA Pro Tour winner Max Garcia (49.657) conceded him 0.107 seconds to start on the front row for the two Qualifying Heats on Friday, while the third-fastest lap time went to Ethan Ayars (49.783) who will be joined on the second row of the grid by Ivanna Richards (49.849). The qualifying top 5 has been completed by Jay Urwin in 49.919, over four tenths of a second slower than Young. Click here to find the full Qualifying results from Thursday. The Qualifying Heats of the SKUSA SuperNationals XXII, held in Las Vegas between Nov. 14th and Nov. 18th, will start this Friday from 9:30 am local time (18:30 central European time). Click here to find the complete event’s schedule. All results, information and Live timing are to be found on the “Race Hero” online App, SKUSA Official App and “Mylaps” App available via this link.